Passion #1 is very suitable for outdoor crops. It is characterized has being strong and uniform, easy to grow offering a potent and stimulating high. Passion #1 comes strongly recomended by Dutch Passion. It is very suitable for outdoor crops being an indica strain developed in California in the 70's. It has a soft smoke with a citrus scent, has good potency and a stimulating high besides being easy to grow. Passion #1 has been grown outdoors in Holland since 1980 thanks to Dutch Passion and is characterized has being strong, uniform and easy to grow. If planted in early season, Passion #1 can reach 3.5 meters tall although it usually reahces two meters high. The large plants of this specimen are able to produce between 250 up to 750 grams reaching outstanding proportions if cultivated in optimal enviromental conditions.Passion #1 develops large and dense buds that became extremely heavy due to the amount of resin. It is a strain very suitbale for outdoor and greenhouse growers and not for indoor growers. When pruning this plant we recomend to cut only the larger leaves since the smaller ones are often filled with resin. It has a soft smoke with a citrus scent, has a good potency and a stimulating high. If you take some extra puffs you will notice a narcotic, powerful, heavy and pleasurable effect. The THC percentage of this strain (20%) makes it a suitable choice for your outdoor garden or greenhouse. 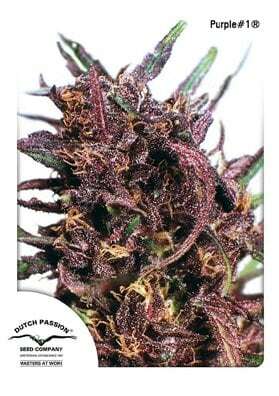 This is another outdoor strain from Dutch Passion that has remained in their seed collection over several decades. This is definitely a strain that you will want to cultivate repeatedly.